Are we defined by Music we listen to? Or the way we wear their merchandise? Band T-shirts, armbands and backpacks, just some of the ways we show our appreciation for the music we love. But is it becoming more of a subject that ourselves are starting to judge others on. I have been told many times, I am being judge because I am not particular interested in the same music others are. When did it become part of a society to judge on personal interest? 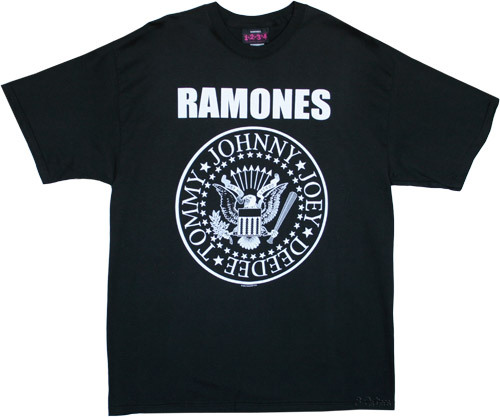 Classic bands such as ‘Rolling Stones’, and ‘The Ramones’ are being adopted by the younger generation in the clothing they are wearing daily, from local high-street shop such as Primark. Therefor lighting the big debate on music is becoming a fashion item and are we losing respect for the music as music. Along with it the social network wars of musicians and fashionista. Many band enthusiasts believe you should only where the band shirt if you know whom the band is and if you listen to them on a regular basic. Showing respect for their music not just them as a fashion item. However surly if band mechanise being used as a fashion item they are getting even more publicity for their music, then they would if only fans wore them. And it helps keep classic, great music in the minds of the younger generation, educating them in the classic of music. For myself I find it as a way of people expressing their personality trying to find themselves in the clothes they chose to wear just like listen to music helps other find their self. It works both ways in my opinion. In a world where we are constantly being criticised for not finding ourselves to when we do being again criticised because it’s not the right thing to be interested in, it seems like no matter what why do people will judge us, we might as well get on with it them and do it anyway. At the end of the day we are doing it for us. Not them. International Rugby: South Africa vs Wales preview. Are Women Truly More Emotional than Men?